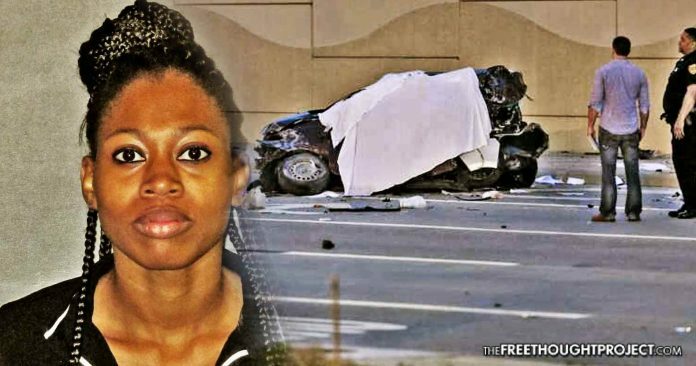 Baton Rouge, LA — A mother has been grieving the loss of her baby for the last few months after an off-duty cop—recklessly driving 94 mph—smashed into her car, killing her daughter and injuring all the other occupants. Now, months after this officer took the life of her child, his fellow officers are charging HER with homicide. Police said the “lack of securing the seat to the vehicle and the loose straps are a contributing factor in the death” of the child and “show gross negligence” on the mother’s part, according to the Advocate. What’s more, Stephens was not the driver of the vehicle. However, she told police that she was the one who strapped in her daughter, so now she is the one facing charges in her death. Stephens—whose baby’s life was ended by a reckless cop—was booked into the Baton Rouge prison on Tuesday on one count of negligent homicide and a seat belt violation. According to the report, three other adults were in the car and were all cited as well. As the Advocate reports, the crash occurred around 8 p.m. Oct. 12, 2017, when a Baton Rouge Police officer — driving his Corvette 94 mph while off duty — struck the Nissan carrying the four adults and four children. Officer Christopher Manuel was driving north on Airline Highway and crashed into the passenger side of the Nissan, which was turning left onto Florline Boulevard at a green light. Manuel was likely speeding because he knew he could simply flex his blue privilege and not get ticketed if a cop were to stop him. Indeed, he was afforded at least some blue privelege after taking this baby’s life. In spite of clearly being at fault in an accident that took an innocent baby’s life, Manuel was not charged until this month. He is facing a single count of negligent homicide and speeding. What’s more, this officer has been on paid leave the entire time as well. Although police have charged Stephens and Manuel, East Baton Rouge District Attorney Hillar Moore III said Tuesday his office has not yet determined whether Stephens or Manuel will face charges, but prosecutors “will review all reports, charges and arrests and make the appropriate decisions based upon facts and law,” according to the Advocate. Hopefully, a mother is not further punished for losing her child. Police car crashes are an unfortunately common reality. In fact, around the same time this officer smashed into the car and killed a baby, in a separate incident in California, a girl was killed after a collision with a Riverside sheriff’s car near Perris Boulevard and Nuevo Road. The deputy hit the pedestrian while responding to an unrelated call, said Riverside Sheriff’s Deputy Mike Vasquez. As TFTP reported last year, Joan Raye, 78, is lucky to be alive after a Franklin County Sheriff’s made the dangerous decision to speed over 80 mph through a neighborhood and plowed into her vehicle. In spite of the fact that the deputy hit her, however, this poor elderly woman, like Stephens, is now being charged with a crime for his negligence.